Crotons are attractive, colorful plants that are native to the warm climate of Indonesia. In warm, tropical climates, crotons will grow into a lovely, upright shrubs. However, crotons are usually grown as an indoor plants, prized for their interesting foliage textured with splotches of orange, red and yellow. Croton isn't difficult to grow, and is easily propagated by taking a stem cutting from a healthy, mature plant. Cut 2 to 3 inches from the stem tip from a healthy croton plant. Make the cut just above a bud or leaf joint. Use pruning shears or a knife with a clean, sharp blade. Fill a container with commercial potting soil that has been dampened ahead of time. The potting soil should be evenly damp, but not drenched. The container must have a drainage hole in the bottom. Strip the leaves from the bottom half of the croton stem. Dip the cut end of the stem in powdered or liquid rooting hormone. Plant the stem in the potting soil, deeply enough that the stem stands upright. Several stems can be planted in the same container as long as the leaves don't touch. Place a clear plastic bag over the container, and secure the bag with a rubber band. Place the container in a bright but indirect light in room temperatures between 70 and 80 degrees Fahrenheit. The plastic bag will keep the environment in the bag humid for several weeks, but if the soil dries out, mist inside the bag immediately. Transplant each stem to an individual 4 to 6-inch container filled with commercial potting mixture when the roots are about 2 inches long, which can take six to eight weeks, depending on the room temperature. You may be able to see the roots extending from the drainage hole in the bottom of the pot. If not, lift a cutting gently from the soil with a spoon, check the length, and return the cutting carefully to the soil. To transplant the cutting, use your fingers to make a small hole in the new pot, only slightly larger than the roots. Plant the cutting carefully at the same soil depth it was planted in the original container, and pat the soil lightly around the roots. Place the new croton where the plant will be exposed to moderate sunlight for at least six hours every day. Place the plant 3 to 5 feet from a sunny window, or near a window shaded by a sheer curtain. 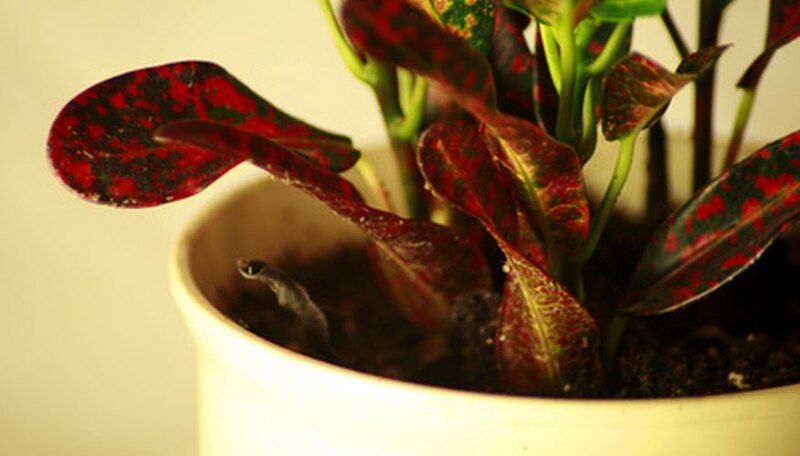 Avoid placing the plant near windows where the sun is hot in the afternoon. Keep the potting soil evenly moist at all time, but not soggy. Pay attention to the plant to learn its particular water requirements. Don't allow the soil to dry out, and if the plant begins to drop leaves, increase watering slightly. If the edges of the leaves begin to shrivel, you may be giving it too much water.